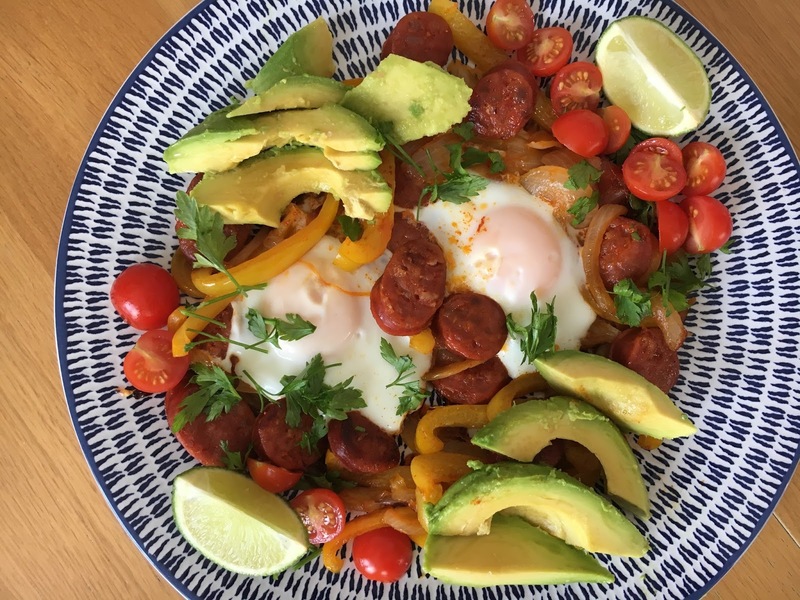 When I make a paella I always seem to have some chorizo left over and late one Sunday morning I decided to use it to make a Spanish Style Brunch. This quick and easy recipe is so healthy and tasty but also quick and easy, perfect for sharing. So I thought I would share another one of my ‘throw together’ recipes of a yummy meal that was very filling! In a large heat proof saucepan or pan that has a lid, pour a few tablespoons of olive oil, and on a medium heat fry the onions, peppers, chorizo and the parsley stalks with the smoked paprika. Cook for about 5-10 minutes until the chorizo is cooked and the vegetables are soft. With your spoon make two holes in the pan; making room to break and fry the eggs and cover until the eggs are cooked to your liking (the longer you leave the pan covered the more well done your eggs will be so keep an eye on them). Once the eggs are cooked slowly transfer the content of the pan to an extra large plate (if not just cut the food in half and place on to a normal dinner plate) decorate around the dish with the avocado, cherry tomatoes and parsley and squeeze with a little lime or serve with a slice of lime for during the meal. We also like this meal with some fresh baked bread like tiger bread and turkish bread (çörek) to help mop up the egg. Thank you! I'm sure this would be nice without the eggs too!